The Warwick Centre for Predictive Modelling (WCPM) is an interdisciplinary research centre focussed on providing a framework for the application of predictive modelling and uncertainty quantification (UQ) tools in science and engineering research. These mathematical tools provide a powerful new way of thinking about how to model complex systems and how to translate research outcomes into improved technology and design. To combine UQ tools - traditionally developed in the mathematical sciences - with the application domain expertise of the physical and life sciences to produce scientific and engineering applications in areas aligned with national and global priorities, e.g. in sustainability, high value manufacturing, and advanced materials. The director of the WCPM is Prof. Nigel Stocks and the Centre has a number of additional local academic staff members affiliated with the School of Engineering. The Centre enjoys close collaborative links with the Departments of Chemistry, Computer Science, Engineering, Life Sciences, Mathematics, Statistics, Systems Biology, Physics, Warwick Business School, Warwick Medical School and WMG as well as with the Centre for Scientific Computing. See our News and Research pages for more details. Directions: The Centre is located in the D-block extension on the 2nd floor of the main Engineering building at Warwick. The Centre is structured around a core of mathematical techniques in close collaboration with researchers in Mathematics, Statistics, Computer Science and the Centre for Scientific Computing. 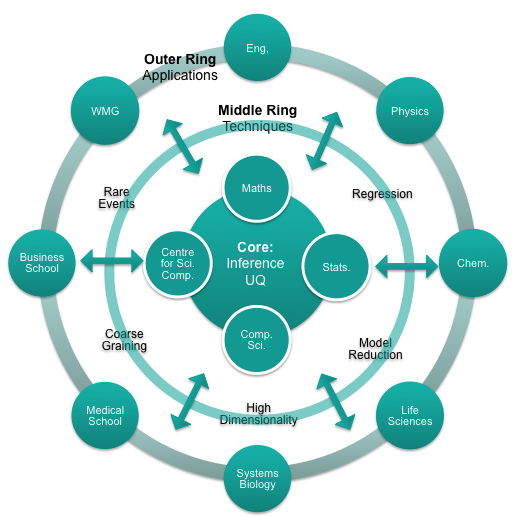 Information flows in two directions between this inner core and an outer ring where the application domain expertise of researchers based in departments throughout the Faculty of Science as well as at Warwick Business School. The techniques illustrated on the middle ring provide some examples of the approaches used in the Centre.